Flair bartending has always been controversial: from those hard-core traditionalists who look down on it as a lower form of entertainment that discredits the profession to those who embrace it as an art and defend its enormous contribution to the guest experience. The Toronto Flair League (TFL) is a collective for all those bar artists who not only can put together a great show by flipping bottles and tins and setting bars on fire but can do it while offering a top service: skill, speed and grace together to offer and unforgetable experience to the guest. Night after night, the TFL guys polish their skills to raise the level of flair bartending in Canada and show the world that bartending is an art. 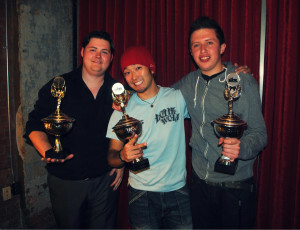 Nine of Toronto’s best flair bartenders, all of them quite young, ambitious and really promising gathered at the College Street Bar, a venue with a reputation for opening its doors to bartending talents, for a working flair competition to demonstrate that flair is not only for flash, but also for cash. Congratulations to the participant bartenders. You guys show the world that flair bartending is taking over the industry. 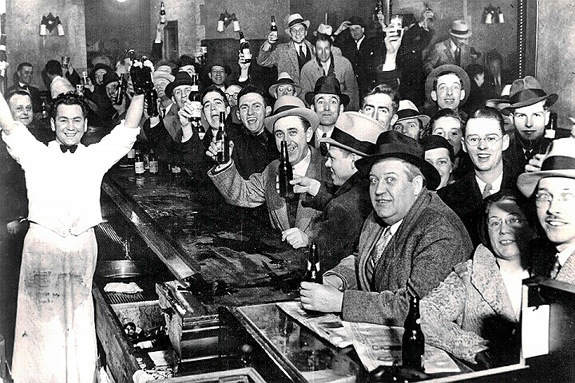 During the Great Depression, with expendable income on the decline, people did not slow their drinking; rather, they started drinking more. With the sudden rise in demand for spirits, consumers turned to what was readily available — bathtub gins and whiskeys better suited to removing paint. To stay afloat, bartenders had to be creative. This led to the rise of the cocktail culture, when bartenders added seasonings and other beverages to mask the taste of inferior spirits. Today, with the downturn in the economy, the pressure on bars to attract and retain guests is steadily increasing. Uncertain of the financial future, consumers are cutting out time spent at their favourite establishments. Like the early ‘30s, this is putting the imagination and technical knowledge of today’s bartenders to the test. But how do you re-introduce the concept of quality cocktails during a recession, when guests have been programmed to enjoy drink menus often designed around speed of service and profit margins? The first step is to ease consumers into it. A good way to do it is through a fresh cocktail night to introduce the concept to guests rather than force them into a more costly, unfamiliar cocktail menu right off the bat. popular or classic drink, such as the Sidecar, French 75, Manhattan or the Old Fashioned, which were born out of prohibition using inferior spirits that still warmed the soul. Today, with much better ingredients available, your bar can capitalize on the recession by becoming memorable in cocktails. The second step is to “dare to be different.” Much like guests, many bartenders have become accustomed to using syrup or powdered sweet and sour mixes and the thought of putting an egg in a cocktail is sure to elicit a shudder or two from some. While it’s important that we work to educate guests, bartenders may require just as much, if not more, training on what a quality cocktail entails. Creating an avant-garde drink list doesn’t necessarily require jumping into molecular mixology, bottling your own bitters or infusing spirits behind the bar. Rather, it involves a little effort and a few fresh, quality ingredients to get you — and your drinks noticed. The final step is to commit to consistency. This involves everyone involved in cocktail preparation. By following these three steps, you will reap the rewards during the recession. However, it’s important to keep in mind these things take time. In the eight decades we’ve been “freely” serving cocktails since the repeal of prohibition, many people have long forgotten what quality is. A few good cocktails may be just what you need to take the edge off. How many of you loved that show Cheers? If you do, you’ll remember that every time Norm walked into the bar on Cheers, the entire bar would call out in unison “NORM!” It didn’t matter who was behind the bar, they knew what he drank, and it was ready and waiting for him as he assumed his position at the end of the bar. Norm embodied the “regular,” the men and women who frequent your establishment regularly. They are the ones who more often than not, tip well, and don’t ask for any special kind of service. In many cases they are the types who spend thousands a year in your establishment. They are the cornerstones of your business, you certainly can’t afford to lose them, so the question clearly is how do you keep them and how do you get more of them? I’ve seen lower volume establishments where regulars are praised and glorified, and high volume bars also where they are overlooked with the attitude that “it doesn’t really matter what kind of service they receive, they’ll come back anyway.” In an industry where service is paramount to the success of your business and your frontline service, staff are often on a career stopover on the way to something better, operators need to actively empower their staff to make sure that they you are cultivating long-term relationships with as many clients as possible, and creating experiences that they’ll remember, and come back for. A good rule of thumb is that management should always be where the money is. If the restaurant is operating, management needs to be making regular rounds checking on guest experiences, not just server problems. Quite often guests will deal with sub-standard service by leaving little or no tip, and leave feeling dissatisfied. Management can circumvent this experience with a quick chat with each table. Everyone wants to feel special, yet most servers overlook the simple things like a smile and a genuine interest in a guest’s well being. Anticipating the needs of your clientele is the surest way to make people feel special. People respond to that kind of service, and with this philosophy every guest is a potential regular. It is important that the servers are focused on providing service tailored to the guest’s needs. Obviously a birthday party and a solo businessperson require different styles of service. Also, it may not always be possible to chat and check with every table in your establishment, so creating an atmosphere where your service staff feels comfortable approaching management to resolve guest issues in a timely manner is crucial to your ability to turn any negative experiences into positive ones. The bottom line is that when the service and food are good, guests will probably come back for seconds, maybe even become your regulars. If things go wrong and the problem isn’t addressed, you’ll never see them again. If there’s a problem and you address it, you guarantee that they will come back with their friends. Maybe they can be your regulars too. Adopt this philosophy and you will reach the level of success that only a few will experience in their lives. With the diversity of liqueurs on the market today it is possible to make a drink taste like virtually anything. Distillers have made it easy for mixologists to shape the profile of a drink. With base flavours like vanilla, cacao and hazelnut, it’s no wonder drinks like the Crispy Crunch shooter are consistently popular. I often wonder how long it will take before we see a chocolate martini dessert, where the kitchen begins to mimic the flavors being produced on the bar instead of the other way around. Perhaps the service of fusion dishes in traditional bar glassware like wraps in oversized shooter glasses and dessert mousses in martini glasses is an indication that it’s already happening. There is definitely an attraction to sweets that makes drinks like the chocolate martini popular. Everyone has a sweet tooth, but most people can’t have more than a few sweet cocktails before they need a change of pace and flavour profile. With a myriad of sour liqueurs on the market, it’s hard to know which flavours will complement each other. Sour peach or blueberry have vibrant eye catching colours, but too often, these ingredients find their place on the back bar and never move because no one has taken the time to experiment. Current bar books and recipe manuals will give you an overview with some recommendations. Some manufacturers will also include token recipes on the bottle itself, but there is no better way to find out what fits with your concept or client base than spending some time experimenting for yourself. Regardless of whether you’re a bartender, bar manager or concept director, (or perhaps you’re all three) a little education and the willingness to experiment can go a long way towards creating some great custom cocktails. Before you spend any more money on additional ingredients like sour watermelon liqueur, look at what you can make with what you’ve currently got on your bar. There are lots of drink engines on the Web, including a good online cocktail cabinet for free at www.bartenderone.com where you can check-off the ingredients (both alcoholic and non-alcoholic) from a huge list and it’ll generate a list of all the cocktails you can make with your current ingredients. I find that quite often the bottled sours have a bit of a laboratory look and taste to them, and if using sour liqueurs is not your speed, I encourage you to experiment with traditional sour cocktails made with raw ingredients. I guarantee that it will render better results than the bottled concoctions available, and you may just find a new favourite cocktail in the process. Whisky and Amaretto Sours are definitely the most common in Canada. South of the border, Bourbon, Midori (melon liqueur), Pisco (brandy) and Tuaca (vanilla) sours are all very popular. If your bar makes an amaretto sour with a shot of Amaretto and barmix, try taking a few extra seconds to craft one from scratch using the sour recipe that follows and then do a taste test. The results are like night and day. The sour recipe below can be modified into many different variations simply by changing the alcohol. See you behind the bar!! Walk into almost any hip Toronto, Vancouver or Montreal restaurant and the cocktail menu you’re handed will likely describe mouth-watering concoctions that use fresh herbs, organic fruit and other top-notch ingredients. Using cucumber in a cocktail may sound ridiculous at first. Until recently, only a few bartenders would even consider using cucumber as a garnish on a Bloody Caesar or Mary, but all of that is about to change. Cucumbers have somehow made the transition from a low-cost garnish to a top-shelf ingredient – bar chefs have embraced cucumbers as a hot, or cool, new addition to menus, along with a host of other ingredients that are making the migration from the kitchen to the bar. Most restaurants today aim to provide no less than the best when it comes to the food produced in the kitchen. Fresh vegetables make the best salads, and with a push towards healthy eating, many of our guests are opting for the healthier side salad versus fries or a baked potato. When we prepare drinks on the bar or food in the kitchen there should be more than a few similarities in our method. It seems more than a little ironic that we will accept nothing less than the best on the culinary front, and accept just about anything when it comes to the bar. New York’s “King of Cocktails,” Dale DeGroff, head bartender of The Rainbow Room, is credited with reviving upscale specialty cocktails, having invented some 400 cocktails with fresh juice and no mixes. He emphasizes the importance of approaching a bar the way a chef approaches his/her kitchen. He believes that cocktails, like food, are about ingredients. Increasingly, chefs are working with mixologists to create new and interesting drinks that contain ingredients not previously found in cocktails. 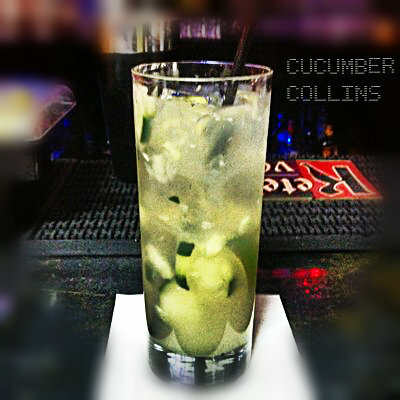 Cucumbers have been a great addition to the cocktail list – they are not sweet, but lend a very refreshing taste. Many restaurant patrons will have a cocktail to start the meal, and then move on to wine with the meal. The challenge is to create a cocktail that is good enough to prompt the order of a second round before the bottle of wine hits the table. Quite often it’s a little more than the smell of freshly muddled mint that prompts a run on mojitos. Working in an industry where the up sell is fundamentally important to profitability, fresh seasonal cocktails that sell themselves are worth their weight in gold. This week we are starting a new series of stories with BartenderOne’s most successful graduates: From all over Toronto, Canada and the World these bartenders are living proof that success in bartending as in anything else in life is achievable as long as you are willing to put the work and effort required. In an industry where competition is fierce, these stories also prove that a proper bartending education gives you an edge when the time to find the job of your dreams comes. For this first chapter we have Michael Mulhall. Michael arrived in Toronto a few months back from Ireland. 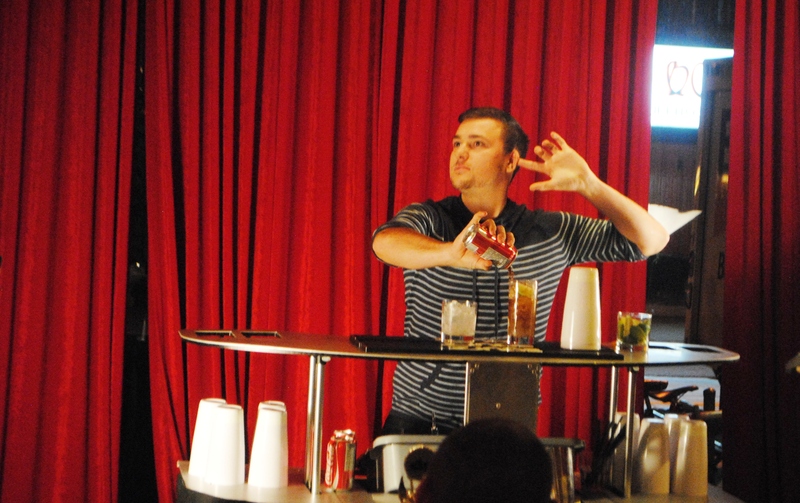 With a background as a barista, Michael felt that he needed a shift on his career in Canada and joined BartenderOne’s MasterClass. His outstanding performance along with his charisma granted him a seat on the first generation of the Blazers Challenge Project. Chosen as one of the four finalists from the first monthly qualifier, Michael soon became a key member of the College Street Bar team. His charming accent and good stories made him a favourite for patrons and his growth during his apprenticeship process was extraordinary with his participation in additional BartenderOne events such as TeamBuilding workshops. Here a quick Q&A session with Michael to learn his story and secrets. Enjoy! Q- Michael, What is your favourite cocktail? A- I’m a big fan of the College Street Bar. They’re charismatic, passionate, make their guests feel at home, and always put on a great show. Q- What is your specialty in bartending? Rather than specialize in any one area I take a holistic approach to bartending mastering every area to the best of my ability. Q- Where do you work right now? Q- What are your main goals as a bartender/mixologist? Even before ever hearing about flair I had already taught myself how to juggle and I’ve a great appreciation for skillfully crafted cocktails so I aspire to competing in both flair and mixology competitions. 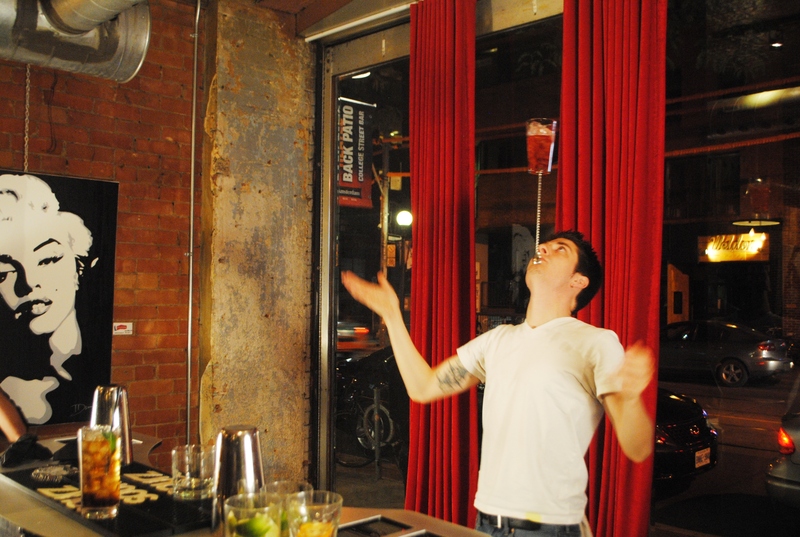 Q- What do you consider should be the main skills every bartender should possess? Anybody can mix a cocktail but to be a successful bartender you need to have good social skills, hand-eye co-ordination, and a great memory to remember recipes, orders, guest names and their preferences. Q- What do you love the most about this profession? I love creating a positive experience with each guest so that they leave feeling better than they did when they first walked in. Brightening their day lets me know that I’ve made a difference in somebody’s life. Q- What you don’t like about bartending? The moment you dislike anything or anyone it owns you. I prefer to view the world from a positive frame, to think constructively, to focus on possibilities and solutions, and to inspire others to do the same. Q- How do you see yourself in 5 years in bartending? I’m Irish so it’s in my nature to want to travel all around the world. I envisage myself in the future bartending on both cruise ships and abroad in as many foreign countries as I possibly can. 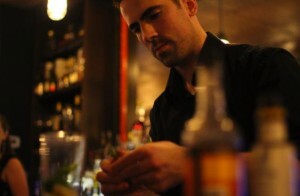 Q- What would be your main advice to those who are preparing to become a bartender? Finding your first job can be tough but after you land one don’t be afraid walk away. I learned this the hard way. I naively ignored the signs, my employer went bankrupt, and I lost my job minus my final 3 weeks of pay. Thanks Michael. Remember to stop by Foundation Bar at Toronto’s Eaton Centre to enjoy one of Michael’s masterpieces and get to listen to a few good Irish stories. By definition, a bitters is an alcoholic beverage similar to a spirit but principally derived from herbs and citrus dissolved in alcohol. Bitter liqueurs like Jagermeister were originally consumed for their medicinal qualities as much as their intoxicating properties, however, those mentioned here are considered digestif. There are hundreds of brands of bitters but the worldwide bestseller and most readily available one in Canada is Angostura. In addition to its original bitters, Angostura has an orange bitters that works well in cosmopolitans, negronis and margaritas as well as most cocktails containing Campari, Cointreau, Grand Marnier, triple sec or blue curacao. Other exceptional orange bitters include Regan’s Orange Bitters No. 6, Stirrings’ Blood Orange Bitters and Fee Brothers’ West Indian Orange Bitters, which also produces grapefruit, peach, lemon and mint flavoured bitters. And then there’s Peychaud’s Bitters. While similar to Angostura, Peychaud’s has a big, bold red fruit flavour. Over the years, the widespread use of bitters has dwindled due to the lack of education about this alcoholic liquor and bartender ambition. However, a couple of dashes of bitters can make an enormous difference in the depth of flavour in your drinks. They are also the best value for money investment a bar can make. Take a traditional balanced cocktail like the Cuba Libre (rum and coke). Four elements are used to balance this drink and make it a bestseller: rum (strong); ice or water (weak), which balances the strength of the rum; cola (sweet); and lime (sour), which balances the sweetness of the cola. When balancing a cocktail based on these two axes, (strong versus weak, sweet versus sour), you end up with a drink that hits both sweet and sour taste receptors. Because the Cuba Libre hits two of the four taste sensors on the tongue — the others being salty and bitter — it is given a rank of two. of a great balanced cocktail. Even though its namesake is ‘sour,’ the addition of sugar or simple syrup balances this drink and makes it palatable. Most bartenders use rye or bourbon, simple syrup and fresh lime juice to make this cocktail. However, if you look at the classic and sometimes forgotten recipe, it calls for two dashes of Angostura bitters. 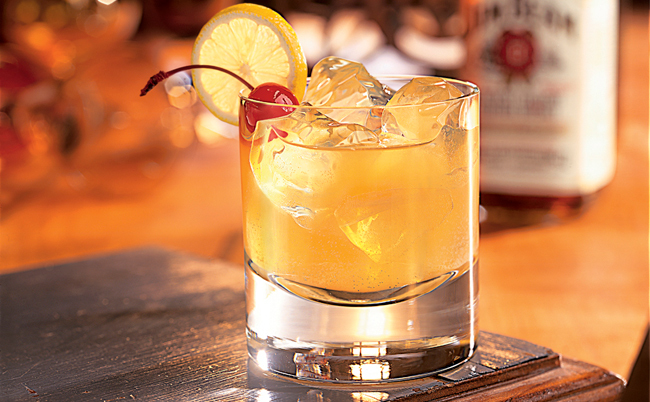 The addition of bitters to a whisky sour hits sweet, sour and bitter notes on the tongue, giving this drink a rank of three. Drinks like the margarita naturally hit three of the four taste receptors — sweet (orange liqueur) balanced by sour (lime juice) and salty (salted glass rim). Adding a few dashes of orange bitters can create a cocktail that hits all four taste receptors, providing the drinker with an unparalleled taste experience. So now you know all of this, get those bitters and pimp your cocktails to the next level.